If you own or would like to buy horses, you will obviously need a place for them to sleep and to store their feed, hay, and tack. You may also want a place where you can ride them even if the weather is hot, rainy, or snowy. An equestrian pole barn can let you do all of these things. Many horse owners choose to build pole barns on their property to provide shelter for their horses. An equestrian pole building can be built in a variety of sizes to accommodate several horses. It is generally a good idea to build a pole barn that is bigger than what you currently need in case you decide to get more horses in the future. 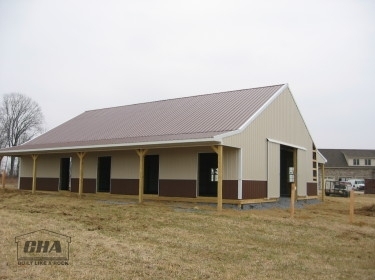 It is easier to move into extra space than to realize that your pole barn is too small and that you need to build an addition to add more stalls. An equestrian pole building can be customized exactly how you want it on the inside. You can put up walls to make individual stalls for your horses in the layout of your choice. You can have a separate room for hay and feed and another one for tack. You can install electricity so you will be able to work comfortably in your horse barn. Maybe you already have a barn to house your horses, but you would like a place to ride them where you won’t have to worry about the temperature, rain, and snow. A solution is to build a pole building that you can use as a horse riding arena. You can choose the size that fits your property and budget. If you want to practice jumping your horses inside the arena, make sure the roof is high enough. You can choose from several types of doors for your equestrian pole building. You can opt for a single or split sliding door, Dutch doors, or overhead doors that can be operated with an electric garage door opener. That can make it easy to move your horses, as well as their hay and feed, in and out of your pole barn. An equestrian pole building can be a valuable addition to your farm. Whether you need a place to shelter your horses in stalls or somewhere to ride them so they can get plenty of exercise, an equestrian pole barn is the solution. It can be customized to suit your needs. 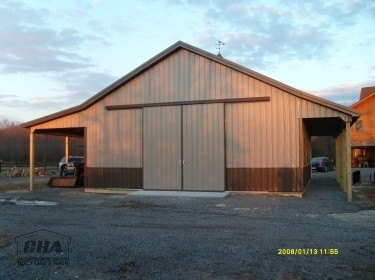 CHA Pole Barns can work with you to design an equestrian pole building for your farm. We can help you decide on the right size, style, and features to match your needs. 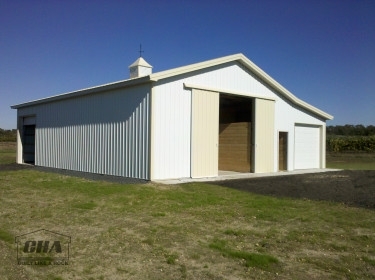 Contact us today to get a quote for a new equestrian pole barn.